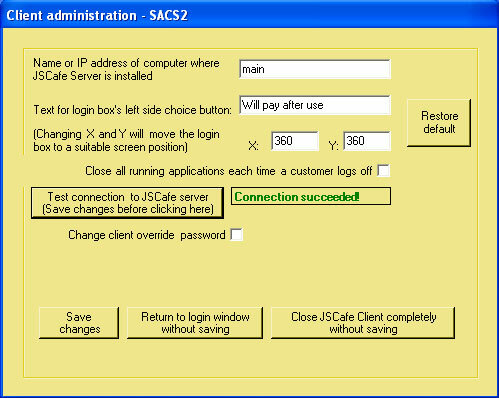 Below is a screenshot of the popular main window of JSCafe Server which is operated from the point of sale computer terminal. Notice that color changes are utilized intensively to optimize the speed and efficiency of communicating status to the cashier. Green means the PC is ready to be allocated to a customer, blue means that a customer is busy at the PC and red means "danger" a customer has logged off and you must request your money from him before he walks out of your shop, black means the PC is idle. A screen-shield prevents a customer from using the PC if he/she has not received an authorization password from the cashier at the point of sale computer. CTRL+ALT+DELETE is deactivated so that the customer cannot try any tricks to gain access to use of the PC without authorization. The screen-shield comes with a default black background. 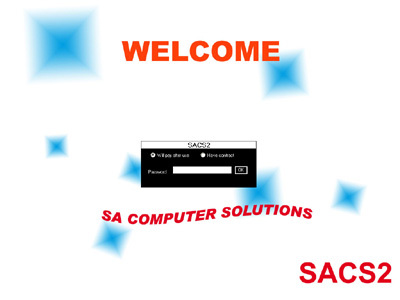 You can change this to a background of your choice by inserting a jpeg picture file in the "C:\JSCafe Client Deluxe\" folder where JSCafe Client is installed on each customer PC. The picture file must be renamed to image.jpeg so that JSCafe Client can recognize it and display it as a background image. When a customer has successfully logged on, a small window showing time and cost is displayed on the bottom right hand side of the screen. This timer window is always on top of all the other windows on the screen. To get it out of the way you click the minimize button so that that it falls down to the task bar. To troubleshoot or setup client, admin control is used, which is quite simple as shown on the screenshot below.